A child learns to read and during early education, we read about the history of our country, read the text of a lesson, read the question, “If you have three apples and take one away, how many apples are left?” At some point, we begin to read for fun. As adults, we read everything from Hotrod magazines about a 400 hp motor experimental car that runs on Black Flag bug spray or about the latest dirt in Hollywood. We buy it, borrow it or pore over it at the beauty shop. According to personal taste, many enjoy thrillers, romance, westerns, how-to, or cook books. Now, folks are reading on the Internet, I-PAD, Kindle or who knows what? Have I read all these books? No, but I have read many of them. Some are just too boring. Some are utterly fascinating from cover to cover. My favorite genre is mystery, but I am often pleasantly surprised to find a vintage book most enjoyable and informative. The preface reads, “The hero is a young man of high aims and noble purposes. But he makes some grave mistakes. The most important lesson in morals to be derived from his experience is that it is unwise and dangerous for young people to conceal their actions from their parents and friends.” The book has several lithograph illustrations. 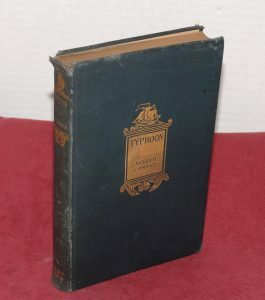 The book exemplifies the morals expected of young people in 1875. Wouldn’t it be refreshing if some of those high standards were still expected of the youth in 2016? Hollywood has proved a poor substitution for learning morals. If you’re interested in learning more about how people lived and thought in earlier days, I recommend reading a vintage book. Have you ever read a vintage book that left a positive impression?